ceda Silver Partner, Regale Microwave Ovens have just launched a new product. The new Microsave® CPS3A Cavity liner for the new innovated 1800watt output microwave oven by Panasonic which has a stainless steel outer door, is ideal for front of house as well as very busy kitchens. Using the brand new to commercial microwave ovens INVERTER technology which not only makes the microwave oven 12 kilos lighter than any other high powered microwave oven but also gives a far smoother cook pattern with no cold spots and gives a saving of 6% less on energy costs! The inner door is made of steel, with no seals or ridges, making it easy to clean and helps to avoid most unnecessary door repairs. The new Microsave® Cavity Liner makes it the ‘ultimate clean machine’ where all parts not covered by the manufacturer’s warranty are protected. 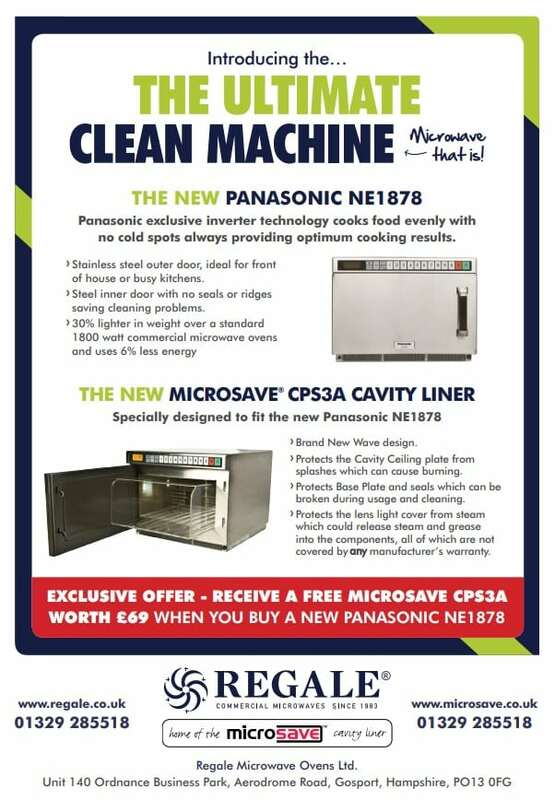 For the launch of the Panasonic NE1878 commercial microwave oven, Regale are giving away the CPS3A Cavity Liner worth £69.00. Regale will unbox the microwave, check it over, place a Microsave® CPS3A inside the cavity with all instructions, correctly re-box the microwave and send out on a free next working day service. This will be a limited offer over the next three months. Attached are the full details.